Excuse me, your art is perfect. Thank you. I was drawn to this because of the Korean hanbok costumes. They still wear these on special occasions and holidays. I lived in Seoul for a year. It was amazing. I love this drawing, it’s just beautiful. This pic reminds me of the drama Flower in Prison. 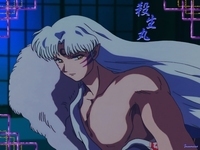 There's nothing Sesshomaru does not look good in. I would see him as the king disguised as an everyday citizen spending the day outside the palace getting a firsthand look at how the people live while Kagome is actually a warrior miko in disguise. Love the hanbok. This is so pretty! Great work, as always! This Korean Joseon inspired art is out of this world! Utterly adorable.